A Little Extra Sun Protection With a Little Larger Than Standard Snap Brim: This is the standard brim we recommend for sun protection. It provides the best balance between sun protection and style. 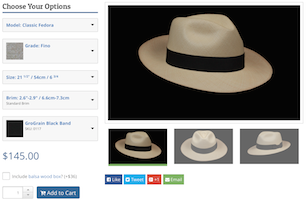 Brim size is a hard thing to recommend because many factors play a part in your selection, such as where you live and the culture, in addition to your personal preferences. But this brim will give that extra protection and still look great in city life (of course that is just my opinion).